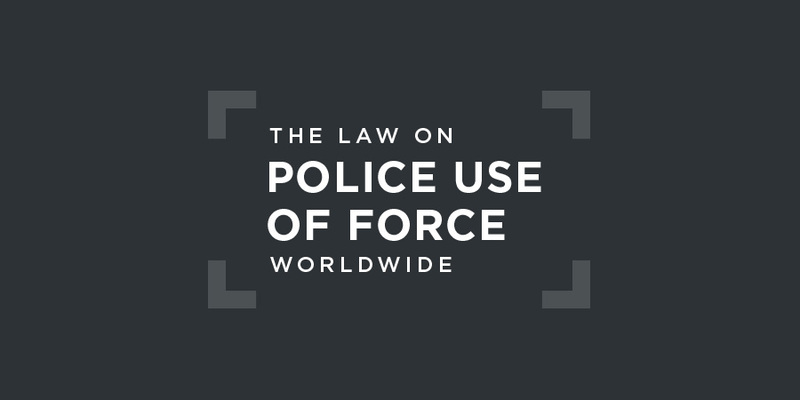 Italy should adopt detailed legislation governing use of force by police and prison officers that complies with international law and standards. Under Article 2 of the 1948 Constitution of the Italian Republic, the "Republic recognises and guarantees the inviolable rights of the person, both as an individual and in the social groups where human personality is expressed." The Constitution does not mention the rights to life or to freedom from torture, but it is stipulated that: "Any act of physical and moral violence against a person subjected to restriction of personal liberty shall be punished. "Art 13, 1948 Constitution of the Italian Republic.It is further stated that: "Citizens have the right to assemble peaceably and unarmed. "Art 17, 1948 Constitution of the Italian Republic. In exceptional circumstances and under such conditions of necessity and urgency as shall conclusively be defined by the law, the police may take provisional measures that shall be referred within 48 hours to the Judiciary for validation and which, in default of such validation in the following 48 hours, shall be revoked and considered null and void.Art 13, 1948 Constitution of the Italian Republic. Italy does not have a coherent body of legislation addressing police use of force. The right to use force to disperse unlawful assemblies is contained in the Consolidated Law on Public Security,Art. 24, Consolidated Law on Public Security.a body of law elaborated in 1931 by the then Fascist government. This body of law regulates the possibility of police forces to act in the interest of public safety and heavily impact Italian civil society. a public officer shall not be punishable if, for the purpose of performing a duty of his office, he uses or orders the use of arms or other means of physical coercion when he is compelled to do so by the necessity of repelling violence or overcoming resistance to authority or to prevent the crimes of massacre, shipwreck, sinking, aviation disaster, railway disaster, willful homicide, armed robbery, and false imprisonment. It is, however, explicitly stated that the law "shall define the other cases in which use of arms or other means of physical coercion is authorized". In fact, the use of firearms has been left to judicial interpretation. The 1975 Prison Administration Act (Law 354 of 1975) states that members of the Penitentiary Police shall not normally carry weapons inside the institution.Art.41, 1975 Prison Administration Act.In case of emergency or if one or more inmates have committed offences connected to criminal organisations such as the mafia, terrorist organisations, or "subversive" organisations, the Ministry of Justice can suspend the rules regulating the treatment of prisoners.Art.41-bis, 1975 Prison Administration Act (also known as the "hard prison" regime).In these cases, any use of force should seek to prevent acts of violence among inmates, escape, or to overcome inmates’ resistance (whether active or passive). Italy has no independent civilian police oversight body. Cases of alleged misconduct or violations committed by police forces are investigated by the Judicial Police, which is composed by members of regular police forces under the direction of the Ministry of Justice. In 2017, the Human Rights Committee expressed its concern at “reports of frequent use of excessive force by police and other law enforcement officials, particularly in the context of migrant identification procedures at certain 'hotspots'". It was "also concerned about the prevalence of impunity for police and law enforcement officials involved in excessive use of force...."
This case, which was decided by the Grand Chamber of the European Court of Human Rights, concerned a number of separate demonstrations – some peaceful, others involving violence – that were mounted against and during the G8 Summit in Italy in July 2001. Two jeeps of carabinieri (Italian military police, a form of gendarmerie) were travelling from an area of earlier contention during which one of the vehicles was suddenly surrounded by rioters and the police attacked by stones, sticks, and iron bars. One of the rioters, Carlo Giuliani, tried to throw a fire extinguisher despite a warning from one carabiniere not to do so. The officer stated that he perceived an imminent threat to his own life and bodily integrity and to that of his colleagues. He fired his weapon at Mr Giuliani, killing him. The Court held that the killing could be justified on the basis that the action was no more than absolutely necessary in the circumstances in defence of a person from unlawful violence. Accordingly, no violation of the right to life was found. Given the vagueness of the terminology used in Article 53 of the Italian Penal Code, the Court of Cassation (Court of Appeal) has provided official interpretations of the scope of the right to use firearms in a number of cases over recent decades. In its Verdict 941/1983, the Court of Cassation ruled that the use of firearms is not legitimate when a subject is fleeting to avoid arrest, since such a practice is not considered a form of resistance or violence. This position has been confirmed in a number of subsequent cases, such as in Verdict 12137/1991. More recently, in its Verdict 6719/2015, the Court of Cassation held that the use of firearms may also be legitimate in a situation where criminals are fleeting if such a practice is carried out in ways that might endanger third parties (e.g. shooting or taking hostages). In its Verdict 7583/1991, the Court of Cassation stated that the use of firearms is not legitimate when hostages are being used as human shields. In its Verdict 7337/2004, the Court of Cassation accepted that warning shots might be legitimate when they are fired wth a view to intimidating assailants or those involved in a brawl. Soon police officers will carry Taser electronic guns so that they will be able to act more safely and will not cause excessive damage to people during certain operations.